The wind was a moderate northerly, the surf high and we put out one 20 hook set baited with squid over the high tide. The gear set out straight. The snapper, weighing in at 21 pounds was caught on the last (trailing) hook. Left : Photo of the 21lb snapper we reported a couple of weeks ago. The fish was taken on 8/6/03 on our kite powered dropper rig from 90 Mile Beach. We were around two kilometres north off Waipapakauri ramp. There has been a growing numbers of kitefishers down here of late. I have heard of good catches of kahawai and spotty sharks from Wainui Beach. From the western lakes - kahawai, red cod, spotty shark and gurnard. Seatoun has been producing good numbers of elephant fish, gurnard, kahawai and red cod. In fact one dude caught a 20lb snapper off Seatoun Beach this year. He did email me the photo but my computer got stolen and its gone. Will be in touch again soon. We arrived at the Rimmer Road access to Muriwai about 9.30am on June 28th. The winds were a moderate south easterly and high tide was at 9:00am. I used a rolling weight with three wheels on my Flexiwing Rig with Skyhook. The rig was baited with mullet and went straight out to 1000 metres offshore on the dropping tide with six hooks in tow. We ran five sets in three different positions on the beach, approximately five kilometres north of Rimmer Road. There was a trawler working just off shore maybe two kilometres out. In conversation with another kite fisherman, he stated that two trawlers had swept down the beach earlier close enough to make him concerned about the safety of his rig. I presume the relatively calm sea would encourage the closeness of the trawlers. Due to plenty of sharks breaking our traces we only caught one shark but it was a terrific day. Even though I am a new kite fisherman I found it thoroughly enjoyable and interesting. Editors Note: Just a couple of tips for newcomers to kitefishing. Generally, if trawlers are working an area, it is because there are fish there. It does pay to keep an eye on where they are travelling however in order to avoid any mishaps. When kitefishing the west coast at this time of year it pays to keep your first set short, a stationery fishing time of just 15 minutes to see if the sharks are around. If your gear returns to shore with no broken traces, few fish, and no half eaten fish, then you can leave it out up to 30 minutes on the next set. Fishing my bottom longline rig last Sunday, the winds were a light south westerly and the seas were calm. One set of 25 hooks was set dead straight out over low tide. I baited up with a combination of salted blue mackerel and squid. We only set the gear for 20 minutes before bringing it back in. The mackerel was definitely flavour of the day as all fish were taken on this instead of the squid. The set returned six snapper and no gurnard, which surprised us. I had some trouble getting it out in the light winds, but once the kite was off shore in the clear winds it was good. Last Friday was a good kitefishing day with plenty of wind, it was cold but that was okay. We sent out 3 sets for the day and caught 24 fish. 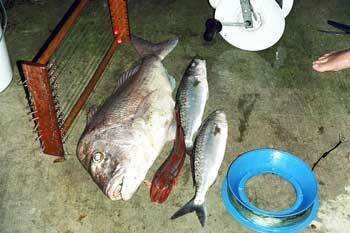 Six snapper, 18 gurnard and one kahawai which was sent back out as bait. All the fish were good sizes. The wind was about 25 knots southerly meaning the kite went straight out and took only took about 15 minutes to get out to the full 1000 meters. One thing I can't understand is that for the first time since I started kitefishing, this was the first time there were no other kite fishers on the beach and plenty of fish available. Photo's have been taken and will be sent in soon. Any tips on targeting kahawai would be appreciated as it seems they are probably getting caught while the gear is moving, either going out or coming in. Ed : Floating bead traces with a two hook pilchard rig baited with a whole small baitfish will catch any kahawai in the area. Some kitefishers do very short sets 200-300 metres out to catch fresh kahawai for bait or smoking. Back in Mokau where I usually fish our reliable morning offshore winds have been scarce in the last month. Big seas and onshore winds mostly. My girlfriend lives in Tauranga, so while visiting I did a set off Papamoa Beach. For the first time ever, I used the rolling weights that Paul makes. After sorting out the correct weight for the amount of wind it was away, rolling along the sand and out to sea along the seabed. A great device for the kitefishing kit. I left the bottom rig set for an hour with salted mackerel baits and caught nine good gurnard. I was very pleased and will set there again on future trips. On July 6 I used my kite powered bottom longline rig and set 25 hooks baited up with squid. The winds were a light southerly and the sea was calm during the outgoing tide. I only had time for one set but was pleased with the results of four snapper. A seven pounder came in first! The other three snapper were pan sized, but just as welcome. The Manukau Harbour has been fishing really well. The trevally seem to have moved out over the past few weeks but the good news is the gurnard are there in numbers. For the past couple of weeks we have been putting the boat longline out and catching some good sized gurnard. Cutting the trevally into small pieces and putting them onto the Target 5/0 hooks resulted in 16 gurnard from three sets last weekend. The previous weekend we had a similar return. Small baits seem to be the key and the longline doesn't have to be out for more than half an hour. Interesting to see a lot of the gurnard had small flounder in their guts. I hope this signifies a great flounder season coming up. Hopefully we'll get out again this weekend and have another crack at these mouth-watering fish.